This is it. My own POWERFUL chest workout. If you want an incredible chest, do this! Let’s start with the THT 5-day split plan. On this routine, we give each muscle one day of primary focus (although each muscle is also worked indirectly on the other days). So let’s have a look at how you should sculpt killer pecs on chest day. 8 sets in total. This is the correct volume of work for a split routine. With more than 8 sets you begin to experience “diminishing returns” and possible overtraining. All areas of the chest are worked thoroughly here – outer, inner, upper, lower. Each of these sets is taken to a point of positive muscular failure i.e. when you can no longer lift the weight through a full range of motion in good form. Each set should terminate between 8 and 12 reps (the optimal range for growth). So for each set, the weight should be so heavy that you cannot get more than 12 reps, but light enough to allow for at least 8. Simple. Now, let us look at how we train the full body on THT and how we factor the chest in. On Monday and Friday, train your chest with 2 sets to failure of Decline Dumbbell Bench Presses. As talked about recently, this movement was scientifically proven to recruit more muscle fibers in the chest than any other chest exercise. Even 1 set to failure will stimulate growth (I give 5 studies in the free THT book to prove this). But 2 is better. Since we’ll be training the same muscles again 48 hours later, you simply can’t start adding more sets. It will take longer than 48 hours to recover and grow from a higher volume of work. The result of such an unwise move would be lack of progress. You will literally get nowhere. If this is news to you, please see my article where I counter CT Fletcher’s assertion that you can’t overtrain. It may just be one of the most valuable articles you ever read. On Wednesday I want you to use the compound movement Deep Dips to stimulate the chest to grow. The word “deep” is all-important here. A regular dip will primarily hit the triceps. The range of motion for a deep dip is to go very low at the bottom, and not all the way to the top (as this is where the triceps really kick in). See my article here on the difference between chest and tricep dips. 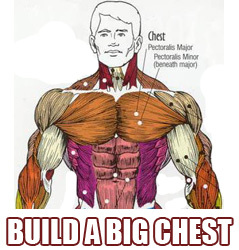 So that’s how you CAN and WILL build a truly impressive chest with THT training. The idea is to train for 10 weeks with the 3-day full-body routine, then take a week off from training (to allow for full systemic recovery). Or vice versa, it doesn’t really matter. Then move on to the 5-day split routine for a further 10 weeks. Take a week off and go back to the full-body plan. This goes on and on, back and forth between cycles. And you get stronger and bigger with each THT training cycle you complete. It’s simple, and so damn effective. The gains people are achieving are phenomenal! And it’s no wonder, since THT is based on the real science of how muscle is actually built. Look at the testimonials from these guys for proof. What about other exercises? That’s where the THT Exercise Bank comes in. As part of the free download, there is a file that tells you what exercises to use as substitutes. Every 10 weeks, you can swap exercises. Pick an exercise you want to change, locate that exercise in the Exercise Bank, and any other movement inside the same box is a suitable replacement. So simple. With the variety of exercises included, even people with limited equipment can succeed with THT. So you really have everything you need to train and grow for the rest of your life! 100% free, no catches. This is not a “teaser” like other websites have you download. This really is the full THT program. Download THT below. After inputting your email, you will be taken directly to the download page for instant access to the workout. You don’t need to log in to your email to confirm anything. I need to make another point. This is a bulking training program and should be used in conjunction with an anabolic diet like my free MANS (carb-cycling) or GLAD (high-carb) diet. Please listen to this…you DO NOT train any differently when you are cutting. You still train THT-style, but couple it with a fat-torching nutritional program, which is what my Total Six Pack Abs program is designed for. Get more details on the programs overview page under section heading “I WANT TO BURN FAT, GET A SIX-PACK, BUT KEEP ALL MY MUSCLE”. Now you know what to do – get training! P.S. 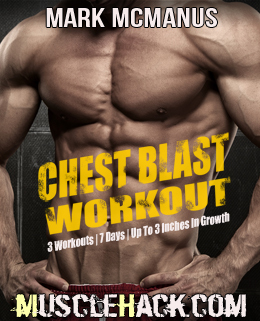 There is the option of complimenting your THT training with my new Chest Blast Workout. Subjects saw rapid gains in chest size (up to 3 inches) in just over a week. This is a “hyper-intense” routine. There are strategies in there that you’ve never tried or even heard of before. Hi mark Iv a quick question,, what’s ur view on using THT in a push/pull/leg split, training each body part every 5 days? Giving you enough time to recover but hitting each body part twice a week using the THT principle with 8 sets and between 8-12 Reps,, but as you be training shoulders with chest, you will only do 6 sets for shoulders after chest ( eg military press 3set, lat raises 3set) as ur shoulders are involved in the chest work. Plus if you miss a training session you don’t go 8 days before hitting that area again? Mark what incline you got for partial flyes and incline barbell press. Oh and what’s carb cycling, Mark? @Spud87. I’m not a fan of a push-pull split. I designed the 5-day THT split as the optimal way of splitting the body up. As an experiment, you could try not taking the weekends off, and on Saturday doing your Monday workout again (and so on). You would hit each part every 5 days, although there is no systemic recovery. You may need a week off sooner than 10 weeks. Though, nothing wrong with experimenting with it. @Bazza. The flys are DECLINE, the incline bench press is INCLINED. Now, less is more here. Mine is about 35degrees I’d guess both for incline and decline. The higher or lower the degree, the more you take stress OFF the chest and place it elsewhere. On the decline a steep angle starts to become an arm exerise, and on the incline, starts to become a shoulder exercise. So less is more here.